It is a beautiful fall day in Pocahontas County, West Virginia. 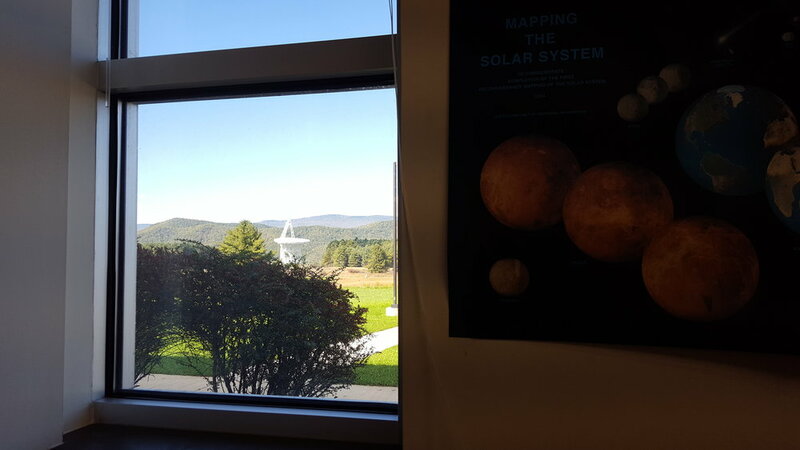 I am currently working from the library in the Jansky Lab at Green Bank Observatory. 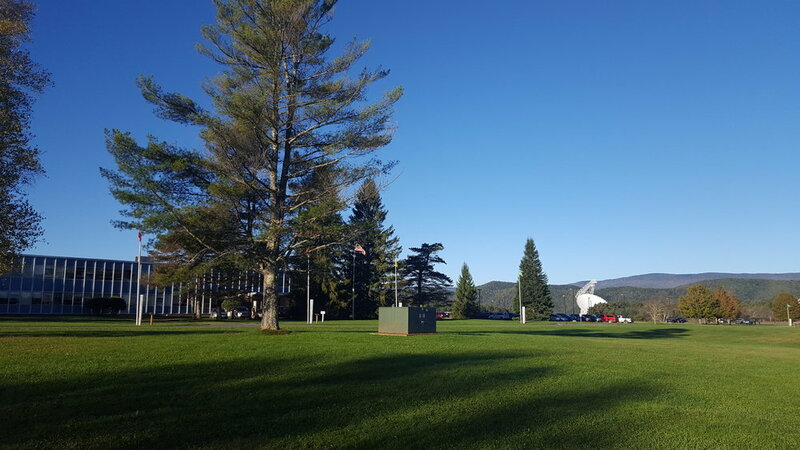 The arm of the Green Bank Telescope (GBT) is just visible over the other end of the buidling, mountains speckled with rusty orange trees in the background. I'm in Green Bank for just over two weeks on an observing run in which I will carry out observations of the chemistry in two protostars, young stellar objects early in the stages of their evolution on the cusp of star birth. The view of the GBT (white dish, center-right) on the way to the Jansky Lab (building on left) from the Green Bank Observatory residence hall one morning. Only half a week later and the leaves on the mountains behind the telescope have mostly turned orange, a sign that fall is indeed upon us. While my actual observations only took 6.25 hours, the journey to get here is one that started several months ago. Astronomers often put as much work, and perhaps even more, into obtaining observing time as they do using the telescope to collect data. This process is generally hidden one, so I am going to give you a look into how the proposal writing process works. Between two and four weeks before a proposal deadline, the radio astronomy observatory to which proposals are due releases a call for proposals. This announcement lists the dates for the next observing cycle, the instruments available during that cycle, and the deadline for proposals. In the case of the current GBT observing cycle, semester 2018B, observations are being carried out between August 2018 and January 2019, and the proposals for this semester were due February 5, 2018. While astronomers who intend to submit a proposal have hopefully been thinking about it before the call for proposals is released, realistically the call for proposals initiates a mad dash to read relevant scientific papers, run models, and draft up the actual proposal. Luckily for me, I had already proposed a similar project to the Effelsberg Radio Telescope, meaning that I simply had to tailor my Effelsberg proposal for the GBT. View of the GBT through the window of one of the offices the observer’s periphery where visiting observers can connect to the Ethernet and work online from their own computer. So what actually goes into a proposal? Typically there is an online application-type form to fill out, including an abstract of the project, a list of observational targets (stars, molecular clouds, planets, etc. ), and requested telescope settings (observation time, receivers, frequency ranges). There is also a technical justification where you have to explain why your project is feasible with the instrument you are proposing to use. The other major component of a telescope proposal is a written document, which is typically 4 pages long for a radio telescope proposal. This written document contains both a scientific justification and a technical justification (or a description of observations). Both of these pieces should be written for a general astronomy audience since they may be reviewed and evaluated by an astronomer in any subfield. The scientific justification provides background information on the scientific question you are trying to answer, including a description of the targets you selected and why they can help you answer that question. This part also explains any predicted outcomes and how you derived those predictions. In my case, I predicted being able to detect certain molecular lines, which I determined from models that I derived from abundances and temperatures of methanol (CH3OH) in my targets and other molecules not previously found in these targets based on typical relative abundances in other protostars. Finally, perhaps the most important component of a telescope proposal is providing motivation for answering your scientific question, especially if the proposal is read by someone outside your field. You want your reviewer to understand how this research question will impact other areas of research and how your field will progress if your observations are successful. There are far more proposals submitted than what can be observed, so the reviewers must be convinced that a proposal is valuable before it can be considered for acceptance. The second part of the written aspect of the proposal is the technical justification or description of observations. In this, the proposer puts the technical justification from the online application-type component into context with respect to the science objectives. Here, the proposer should explain why they selected different settings and how these are the best settings for achieving the proposed science goals. This should include explanations of proposed observing times and achievable spatial resolution and how those are sufficient. A technical justification should also explain why a specific telescope is requested and not one at another observatory (without talking trash on another 'scope, of course! ); in my case I explained that the signals I am looking for are quite faint and thus I need the most sensitive (i.e. largest) telescope possible. I described models I generated for smaller telescopes that required exceedingly long observation times that would be unpractical, even if they were granted. An example of one of the models included in by GBT 2018B proposal (legend excluded). Different colored lines indicate the predicted line strengths (in mK, or milliKelvin) of different molecules in one of the protostellar targets. After submitting a telescope proposal, you have to wait several months to hear back. During this time, proposals are sorted by observation category (mine was designated as an "Interstellar Medium" proposal) before being sent out to a review panel. The exact process here isn't quite transparent, but individuals on these panels (for the GBT, they are typically staff at the Green Bank Observatory) read sets of proposals separately before meeting together and deciding on how to grade the proposals. For the GBT, each proposal is assigned a grade number on a linearly-ranked scale from 0 to 10, where 0 is the highest score and 10 is the lowest. Different cutoffs are set for letter priority grades—A, B, and C where A is highest priority—and rejections that will be used to weight accepted proposals in how they are scheduled. The results of the proposal review comes out several months after the proposal deadline and are posted on the observatory website (in the case of the GBT) and emailed out to the principal invesitgator (PI, or lead scientist) listed on the proposal. The abstracts for accepted GBT proposals are listed in the NRAO online proposal libary, where you can search by telescope, observing cycle, and science category; A screenshot of my proposal abstract is below. A time allocation report is also typically published to show how many proposals were received, how many were accepted, and how much observing time total was available and requested. Perhaps the most widely cited statistic among astronomers is the oversubscription rate. For 2018B, the oversubscription rate was 3.0, meaning that there were 3 times as many proposals submitted as there were accepted. Screen shot of my accepted GBT 2018B abstract in the NRAO proposal library. After all of this, it is time to schedule observations and actually carry them out, which takes several months or more still. I completed my observations last week, in mid-October, more than eight months after I submitted the proposal. The process from proposal writing to observations is quite long, and as indicated by the oversubscription rates, often unsuccessful. Yet it is a necessary (and I argue an enjoyable although stressful) part of being an astronomer.